Bruce A. Lewis (laborer); Basil Chase (waiter); Benjamin Harris (laborer); Daniel Young (waiter). Lewis Bruce (laborer); Benjamin Harris (laborer). Louis Bruce (laborer); Benjamin Harris (laborer). Mason Williams (laborer, rear of lot [business address? ]); Lewis [sic] Bruce; James Butler (laborer); Ann Harris (washing); Elizabeth Miller (widow, cook); Alice Sedan (seamstress). Amelia Bruce; Lewis Bruce (laborer); John H. Thornton; Anna Harris; Benjamin Harris (laborer). Basil Chase (laborer); Benjamin H. Harris (messenger). Mary Parker; Benjamin Harris (messenger). Mary Parker (servant); Benjamin Harris (messenger); R. Davis (watchman). Roley Davis (watchman); Benjamin Harris (laborer). Lee Maxwell (laborer); Benjamin Harris (laborer); Richard A. Neal (painter). Leon Howard (laborer); Benjamin Harris (laborer); Richard A. Neal (painter); Lee Maxwell (laborer). Richard A. Neal (painter); Benjamin Harris (laborer); Richard Gant (waiter); Lewis Bruce (waiter); Ann Harris (washing). Eliza E. Washington (servant); Benjamin Harris (laborer); Richard A. Neal (painter). Richard A. Neal (painter); Richard Gant (waiter); Benjamin Harris (messenger). Richard A. Neale (musician); Richard Gant (waiter). Richard R. Neale (painter); Benjamin Harris (laborer). Richard Gant (General Land Office); Benjamin Harris (messenger); John Thomas (laborer). Austin Banks (laborer); Benjamin Harris (laborer). Fannie Jackson; Benjamin Harris (messenger). Benjamin Harris (messenger); J. E. Johnson (stenographer); James Jenkins (laborer). Annie Harris (widow of Benjamin H. Harris); James Jenkins (laborer). George W. Butler (laborer); Joseph Butler (painter); Anna Harris (widow of Benjamin Harris); Charles D. Jenkins (janitor). George Jones (driver); John Jones (clerk); Arthur B. Jordan (laborer); Elizabeth Jordan (widow of James Jordan); Linnear Tripley (porter); John Hurd (laborer, District Building). Arthur Jordan (porter)); Lizzie Jordan (widow of James Jordan); Joseph Williams (butler); John Hurd (laborer, District Building). James L. Cochran; Lewis Lanford (laborer); James H. Carter (barber). Armstead Nickens (laborer); Cyrus Nickens (undertaker); Augustus Williams (driver). Emma E. Allen (domestic, boards); Amanda Edmonds (widow of John Edmonds); Charles Jenkins (printer, boards). Amanda Edmonds (domestic, widow of John Edmonds); Mrs. Emily E. Allen (domestic). Bertha M. Nalls (saleslady); Amanda Edmonds (laundress, widow of John Edmonds). Amanda Edmonds (widow of John Edmonds); George Wilson (hostler). Channing Richards (lawyer); Peter Hill (machinist); Grace Houghton (clerk, War Department). Hugh P. Hill (machinist); Hugh P. Hill, Jr. (draftsman); Peter Hill (machinist, Navy Yard); Pernina Rohner (clerk, Department of Labor); Raymond W. Weiser (clerk, War Department); Grace L. Houghton (stenographer, Treasury Department). Channing Richards (lawyer); Hugh Hill; Hugh P. Hill, Jr. (draughtsman, Navy). Addison G. Steele; William W. Virts (house officer, Washington Hotel); William E. Virts (messenger, Treasury Department). Craven E. Silcott (cashier, House of Representatives); W. C. Fields (assistant enrolling clerk, House of Representatives); John P. Leedom (sergeant-at-arms, House of Representatives). William C. Fields (index clerk, private claims, House of Representatives); C. Edward Silcott (cashier for sergeant-at-arms, House of Representatives). John B. Hussey (chief, Pensions Division, Treasury Department). Edward G. H. Austin (clerk). Gershon [sic] Bradford (assistant, chart division, Coast and Geodetic Survey). Gershorn [sic] Bradford (assistant, chart division, Coast and Geodetic Survey). Gersham [sic] Bradford (assistant, Coast and Geodetic Survey). Gershom Bradford (chart division, Coast and Geodetic Survey). Gershon [sic] Bradford (assistant, chart division, Coast and Geodetic Survey); Mary A. F. Winsor (widow of Charles F. Winsor). 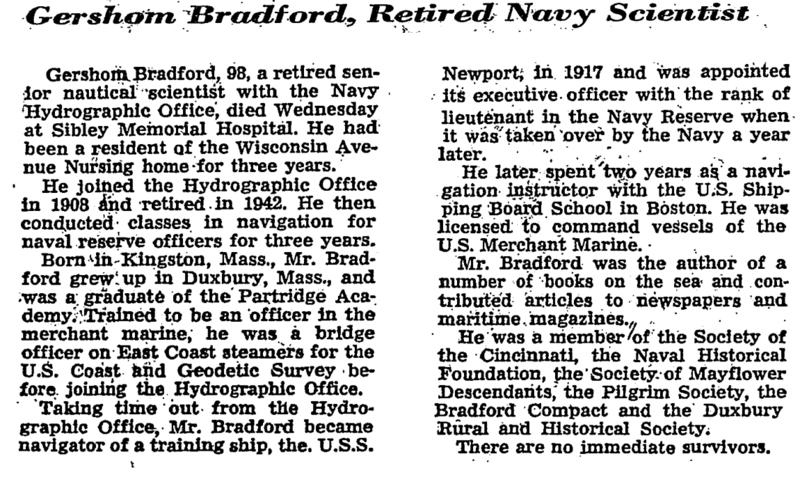 Gershom Bradford (assistant, chart division, Coast and Geodetic Survey); Mary A. Winsor (widow of Charles F. Winsor). Thomas H. Clark (Library of Congress). Horace E. Alexander (printer); Horace E. Alexander, Jr. (clerk); Mary E. Odell (widow). Howard W. Peck (clerk); William H. Peck (Bureau of Printing). Amelia J. Thomas (milliner); Bessie C. Thomas (Bureau of Printing); Elizabeth B. Thomas (stenographer); Henry Thomas (printer); Jane Thomas (widow of James C. Thomas). Amanda Thomas (Bureau of Printing); Amelia J. Thomas (milliner); Bessie Thomas (Bureau of Printing); Elizabeth B. Thomas (clerk); Henry Thomas (Bureau of Printing); Jane Thomas (widow of James C. Thomas). Vincent Ingling (Executive Department); J. J. Porter (Navy Yard). Laura V. Monroe; J. J. Porter (Navy Yard); George R. Brooks (draftsman, Navy). Joseph J. Porter (Navy Yard). Laura V. Monroe; Joseph J. Porter (Navy Yard). Clara B. Thorne (Bureau of Printing); James B. Holloway (clerk, House of Representatives); Laura V. Monroe. Florence H. Allen (Department of Agriculture; Laura V. Monroe; Joseph J. Porter (Navy Yard). Laura V. Monroe (boards); Anthony Sherman (clerk, Navy, boards); Maurice Clark (folder, boards); Joseph J. Porter (draughtsman, Navy Yard). Eliza Monroe; Anthony Sherman (clerk, Navy). Anthony Sherman (clerk, Navy); Franklin Barr (clerk); Mrs. Laura V. Monroe. Anthony Sherman (clerk, Navy); Laura V. Monroe. Clark Phelps (clerk); James J. Porter (draftsman, Navy Yard); Laura V. Monroe. Clara L. Phelps (clerk, Treasury Department); Laura V. Monroe. Maude E. Beck (clerk, Census Office). Mrs. Marie W. Connon; [basement] Sixth International Philatelic Exhibition Inc. stamp exhibitions. Thomas J. Gill; William R. Gill (watchman). Francis W. Yager; Gertrude W. Ashby (clerk, Dead Letter Office). Frank W. Yager; Llewellyn M. Cook (clerk). Genevieve T. Yager (widow of Francis W. Yager). Genevieve T. Yager (widow of Frank Yager); Llewellyn M. Cook (clerk). Gertrude W. Ashby (clerk, Dead Letter Office); Nellie Butler (domestic); Llewellyn M. Cook (clerk); Drusilla Jones (domestic); Genevieve T. Yager (widow of Frank Yager). Gertrude W. Ashby (clerk, Post Office Department); Llewellyn M. Cook (commercial merchandise). Jeff F. Moser (U.S. Navy). Philip J. McHenry (clerk); Philip J. McHenry, Jr. (attorney-at-law, Washington Loan and Trust Co. building). Alfred C. Hawley; Harriet E. Hawley. W. H. Estey (teller, Sergeant-at-Arms, House of Representatives); Susie Poindexter (domestic). George T. Dietz (stenographer); Philip Hicks (waiter); Jacob J. Membert (machinist). Jacob J. Membert (Navy Yard); Francis J. Rogers (Navy Yard). T. J. Connington (Navy Yard); Jacob J. Membert (Navy Yard). Jacob J. Membert (Navy Yard). Jacob J. Membert (machinist, Navy Yard). Charles K. Membert (copyist, Navy Yard); Elvira Andrews. Elvira Andrews (widow of Reuben Andrews). Charles K. Membert (draughtsman, Navy Yard). Charles E. Brown (laborer); Lucinda Brown (widow of William Brown). Anna A. Brown (teacher); Charles Brown (laborer). Charles Brown (laborer); Charles E. Brown (machinist) [same person?]. Mary Simms (cook); Sadie Johnson (cook). Barney Johnson (laborer); Albert Whiting (laborer). Amanda Brown (widow of Daniel Brown); Barney Johnson (laborer); Albert Whiting (watchman). Madison Mabry [sic] (bricklayer); Bernard Johnson (whitewasher). Sarah J. Washington (domestic); Harry P. Godwin (editor). Harry P. Godwin (city editor, Evening Star). Sarah Washington (domestic); Sarah V. Bingham (domestic); Harry P. Godwin (journalist). Harry P. Godwin (city editor, Evening Star Newspaper Co.). Harry P. Godwin (city editor, Evening Star); Ruinette D. Bacon (widow of Ralph Bacon). Alice E. Warner (clerk); Ambrose R. Warner (student); Adele V. Smith (clerk); John Warner (principal clerk, Division of Domestic Correspondence, Post Office Department); Eunice K. Warner (teacher). Homer Dougall (machinist); William D. Fisher (salesman). Simon D. Newcomb (clerk, House of Representatives); William T. Newcomb (civil engineer); Charles W. Rastall (clerk, Navy). William R. Bolten (Government Printing Office); Herman C. Miller (Library of Congress); Mary C. Newcomb (widow of Simon D. Newcomb); S. Ross Newcomb (clerk); William R. Bolten (Government Printing Office). Frank C. Alexander (bookkeeper); Horace E. Alexander (printer); William H. Burger (Coast and Geodetic Survey); William R. Bolten (printer); Frank C. De Costa (clerk); Stephen Stultz (clerk); William Volton (clerk). William R. Bolten (Government Printing Office); F. V. De Coster (clerk, Capitol). Edward A. Brand (machinist, Navy Yard); William R. Bolten (Library of Congress). J. D. Adams (Navy Yard); Thomas D. Adams (Navy Department); S. Hamp Beck (draftsman, Navy); John E. Catlett (conductor); Walter E. Frayser (paperhanger); Nathan H. Healy (druggist clerk); Edward Young (ex-consul). Thomas D. Adams (Navy Yard); Nathan S. Healy (clerk); Edward Young (ex-consul). Thomas D. Adams (Navy Yard); J. Walter McMahan (private secretary); Edward A. Thomas (elevator operator, Capitol). Mary Adams (widow of Thomas Adams); Dorothy Babcock (Bureau of Printing); William M. Clark (clerk, Capitol). C. Gurley Kane (Pension Office); Dorothy W. Babcock (Bureau of Printing); Mary C. Adams (widow of Thomas D. Adams); William M. Clark (clerk, Capitol); C. Gurley Kane (Pension Office); James M. Payne (Payne Brothers); James H. Shouse (messenger, Capitol). Mrs. Mary C. Adams (widow of Thomas D. Adams); Dorothy N. Babcock (operator, Bureau of Printing, boards); Lillian W. Carter (folder, Government Printing Office, boards); James H. Shouse (doorkeeper, Capitol, boards); Mary Wilson (boards). Lillian W. Carter (helper, Government Printing Office). Otto Ratz (assistant examiner, Patent Office); Joseph M. Pilcher (phone operator, Capitol). Arthur G. Bedell; Frank A. Lanning (clerk, Post Office). Washington Evening Star, 10 March 1953, p. 10. 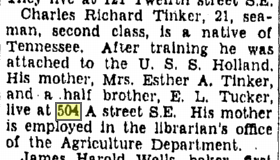 Federal census, 1940, 406 A Street, S.E., Washington, D.C.
Wilvert F. Hubbell (owns, $3,500), head, 40, completed 5 years of college, b. in Va., lived in same place in 1935, chemist, dairy, income $400, other income. Geneva C. Hubbell, wife, 24, completed 2 years of college, b. in Va., lived in same place in 1935, housework. Fay Jane Hubbell, daughter, 3, b. in D.C.
Wilvert H. Hubbell, son, 2/12, b. in D.C.
Orvin L. Wilhite (rents, $32), head, 22, completed 4 years of college, b. in Kans., lived in Yates Center, Kans., in 1935, clerk, government, income $700. Mary C. Wilhite, wife, 22, completed 2 years of college, b. in Kans., lived in Clyde, Kans., in 1935, housework. James H. Green (rents, $25), head, 30, completed 8th grade, b. in N.J., lived in Norfolk, Va., in 1935, sailor, U.S. Navy, income $1,150. Emma P. Green, wife, 31, completed 10th grade, b. in Vt., lived in same place in 1935, saleswoman, five & ten [illegible] store, income $85. Paul A. Ruddell (rents, $32), head, 22, completed 2 years of college, b. in Kans., lived in Fort Scott, Kans., in 1935, clerk, government, income $1400). Jessie P. Ruddell, wife, 25, completed 12th grade, b. in Va., lived in Trenton, N.J., in 1935, nurse, general duty, income $320. Anthony C. Gaunucelte [?] (rents $34), head, 27, completed 12th grade, b. in R.I., lived in Providence, R.I., in 1935, clerk, government, income $1,440. Ellinor [sic] Gaunucelte, wife, 23, completed 10th grade, b. in R.I., lived in Providence, R.I., in 1935, housework. Dorothy A. Gaunucelte, daughter, 1, b. in R.I.
Freda S. McCaulay [? ], lodger, 30, married, completed 12th grade, b. in Ohio, lived in Columbus, Ohio, in 1935, seamstress, dry cleaners, income $1600. Adolphus Lindenkohl (draughtsman); Henry Lindenkohl (draughtsman); Charles Flemer (carpenter). Charles Flemer (carpenter); Charles Flammer [sic]. Charles W. Hepbrun (laborer); Leah Hepbrun (widow of James Hepbrun); Samuel H. Hepbrun (painter). Charles W. Hepbrun (laborer); Leah Hepbrun (widow of James Hepbrun); Samuel H. Hepbrun (painter); Thomas A. Mitchell (clerk); Thomas A. Mitchell, Jr. (telephone operator); Samuel H. Clark (painter); Frank E. Swartout (carpenter); Leah Clark [sic] (widow of James Clark). Leah Hepburn (widow of James Hepburn). James A. Randall (clerk, Adjutant-General Office). James A. Randall (clerk, War Department). H. B. Sabin (clerk); James A. Randall (clerk, War Department). George S. Randall (clerk); James A. Randall (clerk, War Department). James A. Flemer (Coast and Geodetic Survey); James E. Gill (carpenter). Clair R. Hillyer (student); William E. Hillyer (student); William R. Hillyer (clerk, War Department). Clair R. Hillyer (manager); William E. Hillyer (chemist); William R. Hillyer (insurance). Clair R. Hillyer (clerk); Edward L. Hillyer (student); William E. Hillyer (chemist); William R. Hillyer (insurance). Clair R. Hillyer (stenographer); William E. Hillyer (chemist); William R. Hillyer (insurance); Daniel T. Birtwell (clerk). Clair R. Hillyer (stenographer); Edward L. Hillyer (clerk); William E. Hillyer (chemist); William R. Hillyer (insurance); William E. Tufts (chemist). John W. Bulla (inspector, Post Office Department). Beatrice Bulla; John W. Bulla (inspector, Post Office Department). Louise M. Newcomb (stenographer); Mary C. Newcomb (widow of Simon D. Newcomb); William R. Bolten (Government Printing Office). William R. Bolten (Government Printing Office); Joseph E. Cox (clerk); Lewis D. Lawrence (clerk); Mary C. Newcomb (widow of Simon D. Newcomb); M. Louise Newcomb (stenographer). Louis B. Lawrence (clerk, Navy). Edward P. Fitch (clerk, Census Office). William R. Bolten (Government Printing Office); Mary C. Newcomb (widow of Simon D. Newcomb); Mary L. Newcomb (stenographer). Carroll B. La Place (clerk, Post Office Department); Ella G. Kerby (widow of William F. Kerby). Eliza Logie (Library of Congress). Eliza Logie (Library of Congress); Ella G. Kerby (widow of William H. [sic] Kerby). Vernon Kaufman (police); Ethel C. Morrison (clerk, War Department). Mary C. Monroe; Ethel C. Morrison (clerk, War Department); Vernon E. Kaufman (Capitol police). Edward W. Ayres (correspondent, Kansas City Times). William A. Smith (student); Charles F. Smith (superintendent, Congressional Cemetery). William A. Smith (clerk); Charles F. Smith (clerk, Pension Office); Charles S. Smith (captain, U.S. Army, assistant chief of ordnance). Charles F. Smith (clerk, Pension Office); Charles S. Smith (captain, U.S. Army, assistant chief of ordnance); William A. Smith (clerk). William A. Smith (salesman); Ophelia Smith (clerk). Charles A. McNamee (Government Printing Office); Charles F. Smith (clerk); William A. Smith (salesman). Charles F. Smith (clerk, Pension Office); William F. Gullick (clerk). William Alexander [Smith] (clerk); Charles F. Smith (clerk, Pension Office). Charles F. Smith (clerk, Pension Office); William A. Smith (clerk). Charles F. Smith (clerk, Pension Office); Odie MacNamee (clerk, widow of Charles A. MacNamee); W. Alexander Smith (salesman); William A. Smith (clerk); Radford S. Smith (model-maker). Radford S. Smith (pattern-maker); William A. Smith (clerk); William Alexander Smith (salesman). William H. [sic] Smith (clerk). Charles A. Smith (clerk, Pension Office); William A. Smith (clerk). Mary E. Smith (widow of Charles F. Smith); William A. Smith (clerk). W. Alexander Smith (salesman); Radford A. [sic] Smith (pattern-maker). Magdalene H. Berger (clerk); William P. Rice (broker); Ceanna Jones (dressmaker). S. Stephenson (Library of Congress). Frank A. Porterfield (Census Office); Evelyn W. Fant (Library of Congress); Jessie D. Fant (teacher); M. B. Fant (widow of Joseph N. Fant). Eva W. Fant (Library of Congress); Evelyn W. Fant (clerk); Jessie D. Fant (teacher); Mariana B. Fant (widow of Joseph Fant). Eva M. Fant (Library of Congress); Evelyn W. Fant (clerk); Jessie D. Fant (teacher); Mariana B. Fant (widow of Joseph N. Fant); James Berry (cook). Bettie A. Guinand (Bureau of Printing). Jerusha Davidson (widow of John Davidson). Richard A. Allen (Museum of Natural History). James H. Shouse (doorkeeper, House of Representatives). James H. Shouse (messenger, Capitol). Irma M. Rice (clerk, War Department); James H. Shouse (messenger, House of Representatives); Thelma Newell (stenographer, Southern Railroad). E. Blanche Rice (clerk, Treasury Department); Irma M. Rice (clerk, War Department). Theron D. Wilson (nautical expert, Navy). George Schultz (clerk, Navy Department). George Schultz (clerk, Navy Department); Ella Butler (servant). George Schultz (clerk, Navy); Belle Swain. George Schultz (clerk, Navy); George Schultz, Jr. (clerk). George Schultz (clerk, Navy); George Schultz, Jr. (watchman). Henry J. Wylie (clerk); Louisa Warren (domestic). Henry J. Wylie (clerk); Lenora L. Pearson. Henry J. Wylie (clerk); Leonora L. Pearson. Lemuel W. Todd (clerk); Henry J. Wylie (clerk, Marine Barracks). Walter H. Todd (clerk); Henry J. Wylie (accountant). Henry J. Wylie (clerk, Navy). Harry J. Wylie (clerk, U.S. Marine Corps). 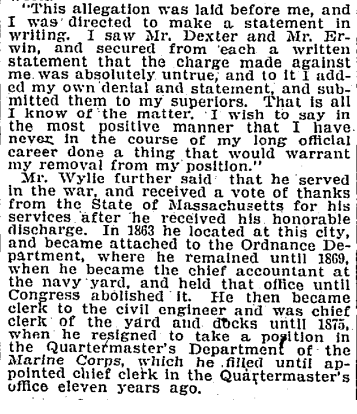 Henry J. Wylie (notary; clerk, Navy)). Harry D. Well (clerk, Navy); Henry J. Wylie (clerk, Navy); John E. Thomas (foreman). Harry D. Well (clerk, Navy); Henry J. Wylie (clerk, Navy). Mary S. Todd (widow of Walter H. Todd); John E. Thomas (foreman); Henry J. Wylie (clerk, Navy). Mrs. Leonora Reed; Henry J. Wylie (notary). Lenora Reed (widow of Samuel Reed); Henry J. Wylie (clerk). Lenora M. Reed (widow of Samuel T. Reed); Henry J. Wylie. Lenora M. Reed (widow of Samuel T. Reed). May B. Wright; Frank T. Jones; Alice J. DeCourcy (widow of Matthew B. DeCourcy); Elizabeth C. DeCourcy (stenographer); Juliet E. DeCourcy (nurse); Mary J. DeCourcy (clerk). Walter M. Fitzmaurice; Ralph Patterson. Walter M. Fitzmaurice; Ralph Patterson; Deborah Cline. Washington Post, 16 April 1978, p. C8. “41 District Area Men on Navy Casualty List.” Washington Post, 2 June 1942, p. 12. 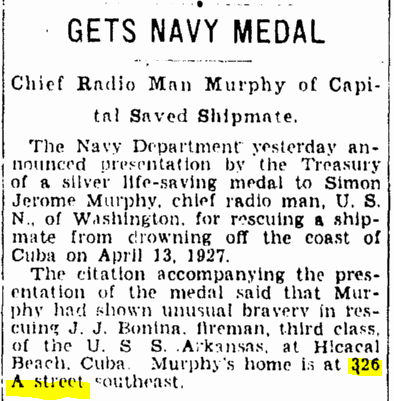 Washington Post, 10 March 1943, p. 3. 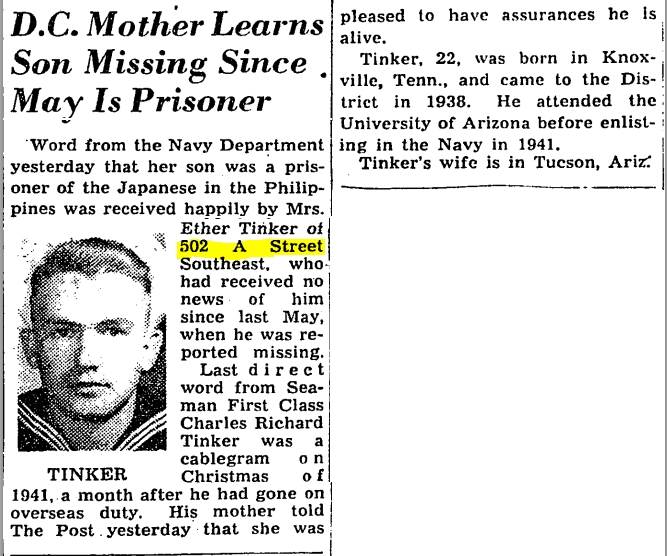 Word from the Navy Department yesterday that her son was a prisoner of the Japanese in the Philippines was received happily by Mrs. Esther Tinker of 502 A Street Southeast, who had received no news of him since last May, when he was reported missing. Last direct word from Seaman First Class Charles Richard Tinker was a cablegram on Christmas of 1941, a month after he had gone on overseas duty. His mother told The Post yesterday that she was pleased to have assurances he is alive. 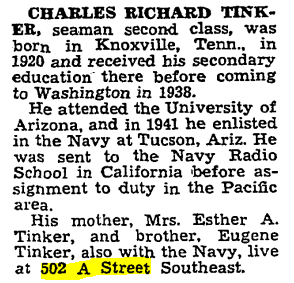 Tinker, 22, was born in Knoxville, Tenn., and came to the District in 1938. He attended the University of Arizona before enlisting in the Navy in 1941. 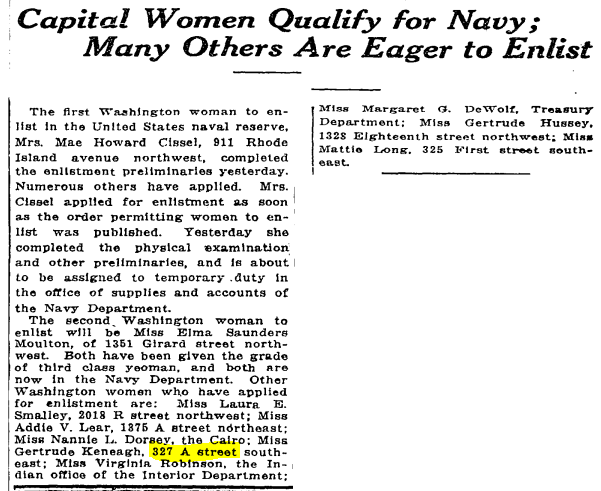 Tinker’s wife is in Tucson, Ariz.
“Navy Lists D.C. Captain as Dead, 9 Officers and 11 Enlisted Men Missing.” Washington Evening Star, 1 June 1942, p. 7. Washington Post, 13 November 1896, p. 2. Washington Evening Star, 28 January 1931, p. 5. Washington Post, 24 March 1917, p. 5. 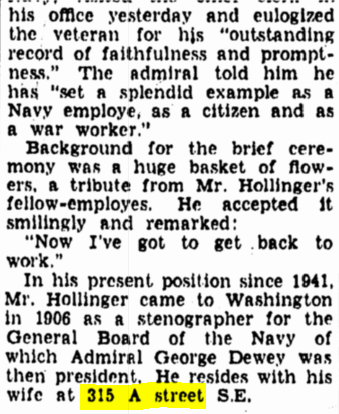 Washington Post, 5 April 1943, p. 9. 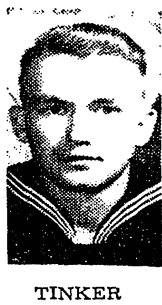 Washington Evening Star, 4 April 1943, p. 19.